Fireworks. Because every birthday ought to end in fireworks. So thanks to Bob Denham, thanks (most especially) to Jonathan Cox, and thanks to John Fink for getting Northrop Frye and Critical Method up and running for this first anniversary. And, of course, many many warm thanks to all of our contributors over the past year. We hope to see much more of you in our second year. As well as, of course, as many more new contributors who’d like to join us. This entry was posted in Anniversaries, Hijinx, Video on August 17, 2010 by Michael Happy. It’s our first birthday today, so let’s have a little fun tonight. Montreal’s Arcade Fire seems to be the hottest band in the world right now, beloved by everyone from David Bowie to Jon Stewart, on whose show they played two sets last week (and Jon almost never has musical guests). They also seem to be some of the nicest people you’d care to meet; there are six of them playing three times that number of musical instruments. They make the cliche about Canadians being sweet tempered and polite a heroic virtue — and explode the myth that that somehow makes us boring. Their new album, The Suburbs, is at the top of the charts and is receiving rave reviews. Why, here’s one now. After the jump, audio of “Month of May” from The Suburbs. This entry was posted in Popular Culture, Video of the Day on August 17, 2010 by Michael Happy. As I explain in the headnote to the Preface, Northrop Frye and Critical Method was written when I was operating in an Aristotelian mode. It focuses on Anatomy of Criticism. Almost forty years of hindsight––what Frye calls the “rear‑view mirror”––enables one to see things in somewhat different contexts. Some of these contexts I have attempted to examine in the Introduction to the Collected Works edition of the Anatomy (available in the Library here). In the early 1970s the Anatomy was from my perspective the central book by Frye that needed to be accounted for. Numerous books and essays, of course, followed in its wake, and the considerable body of writing Frye did in the last decade of his life has a decidedly different emphasis from what he wrote thirty years earlier. I have tried to account for this emphasis in Northrop Frye: Religious Visionary and Architect of the Spiritual World. Still, the Anatomy catapulted Frye from being a recognized authority among the small circle of Blake scholars to someone with an international presence. And most of what continues to be written about takes its cues from the Anatomy. 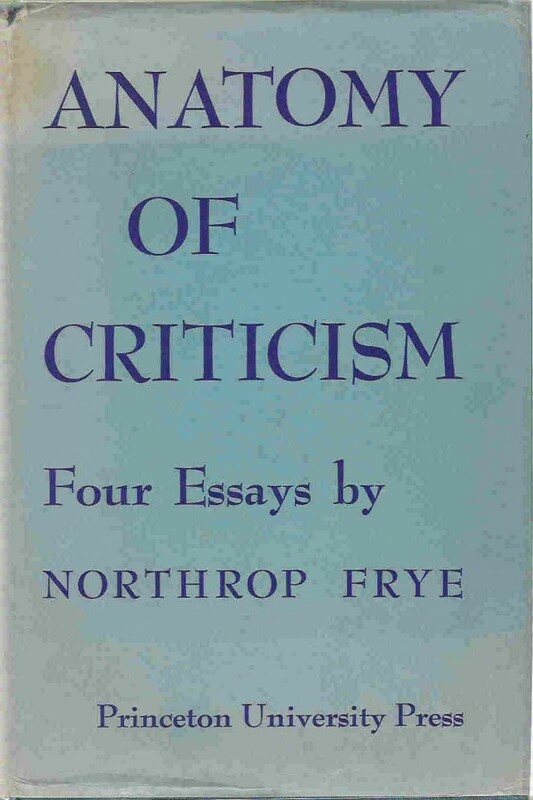 If Northrop Frye and Critical Method helps to illuminate what that book was all about, I will naturally be most pleased. I express my deepest thanks to Jonathan Cox, whom I had the good fortune of teaching and learning from in the undergraduate classroom, for his devoted labor in formatting the electronic text. Thanks are also due to Michael Happy, the indefatigable webmaster of “The Educated Imagination,” which has its first birthday celebration today, for suggesting that the book, long out of print, be made available to a wider audience, and to the Pennsylvania State University Press, for releasing the copyright back to me. This entry was posted in Anatomy of Criticism, Bob Denham, Denham Library on August 17, 2010 by Bob Denham. Today is our first anniversary, and we’re very pleased to be here. We began celebrating early by posting in its entirety yesterday our beloved benefactor Bob Denham’s first book, Northrop Frye and Critical Method. It has been brilliantly digitized for easy access and reading by Bob’s former student and our current administrator, Jonathan Cox. (Our thanks also to our tech support at McMaster Library, John Fink, for posting it.) You can find it here. You’ll be delighted to see that all chapters, chapter sections, and diagrams have their own links, and there is always a link to the next chapter in the top right hand corner, as well as link to the previous chapter in the top left. When we started out a year ago we were simply a “weblog dedicated to Northrop Frye.” We’re now much more than that. Besides the daily blog portion of the site (1000 posts in the first 12 months), there is now a journal containing 18 articles that also serves as the archive for Moncton’s Frye Festival. We have also established the Robert D. Denham Library, which is turning into a singular resource for scholars, students and the reading public. At this point the library houses too many treasures to itemize, but it includes the complete 10 volumes of Bob Denham’s Northrop Frye Newsletter, previously unpublished material by Frye himself (including the remarkable 5 part, 39 chapter Notes on Romance), various reviews of 20 of Frye’s published works, previously unpublished student class notes and exams from the 1940s and 50s, all of Bob Denham’s introductions to various volumes of the Collected Works, study guides and outlines to The Educated Imagination and The Double Vision, two complete books (now including, of course, Bob’s wonderful Frye and Critical Method), various lectures by Frye scholars, and other Frygiana. We hope to be posting audio and video of Frye soon. We also hope that before long we can begin to post student papers and dissertations. Finally, there is our readership: many hundreds of visits a week and many thousands a month from more than 100 countries around the world. We figure that, as we become better known, those numbers will only improve, as they seem to do steadily from month to month. This entry was posted in Anniversaries, News on August 17, 2010 by Michael Happy. On this date in 1959 Miles Davis released “Kind of Blue,” the best-selling jazz album of all time. Fifty-one years later and it still charts! And why shouldn’t it? Here’s the lineup: Miles Davis on trumpet, John Coltrane and Cannonball Adderley on saxophones, Bill Evans and Wynton Kelly on piano, Paul Chambers on bass, and Jimmy Cobb on drums. Oh, and each track is perfect. After the jump, a 50th anniversary commemoration of the release of the album. This entry was posted in Anniversaries, Video on August 17, 2010 by Michael Happy.